The ocean floor is not just a vast expanse of flat rock and sand covered with water. 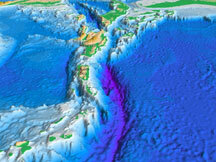 In fact, bathymetric features rising from the ocean floor are just as dynamic and diverse as the topography on land. The ocean has mountain ranges, volcanoes, trenches, canyons, and a host of other complex three-dimensional structures. Imagine a canyon 10 times as big as the Grand Canyon and seafloor trenches deeper than Mt. Everest is tall. Both can be found within US waters. The ocean is a three-dimensional habitat that is home to a vast variety of marine life that live their entire lives suspended in water or attached to the seafloor. Many marine species rely on these different bathymetric features to provide suitable habitat, since about 98% of the world’s marine species live in, on or just above the seafloor. Just as there are three-dimensional structures and features on the seafloor, there are three-dimensional features in the water column as well. Ocean currents circle the globe, transferring heat, nutrients, and life within the water column and across ocean basins. Ocean currents circulate in complex ways that result in highly productive areas rich with life as well as other areas that are mostly devoid of life. Seafloor bathymetry, along with the Earth’s rotation, winds, and several other factors determine the directions of ocean currents. 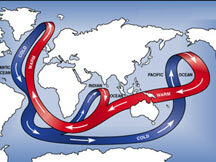 Large currents are connected and encircle the world like a conveyor belt. A water drop riding this current conveyer belt may take hundreds or even thousands of years to complete the loop and make its way around the world. 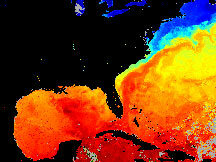 These currents not only impact life in the ocean, but since the oceans and the atmosphere are highly interconnected, currents can also influence weather patterns and impact our life here on land.